Helene and Martin Oppenheimer at NewBridge on the Charles, a senior living community in Dedham. “Martin relies on me,” she said of her husband, who has Alzheimer’s disease. DEDHAM — Like any long-married couple, Helene and Martin Oppenheimer spend hours talking about their family and what’s happening in the world. But most of their talks now take place in a long-term care unit at NewBridge on the Charles, where 91-year-old Martin — who has Alzheimer’s disease and uses a wheelchair — has lived since last summer. Helene is enrolling in a family care program where she’ll be matched with a social worker to guide and support her as she cares for her husband. It’s part of a national push to rethink dementia care at a time when the number of cases is rising steadily, and efforts to develop a drug to slow cognitive decline — the long-hoped-for silver bullet — have continued to falter. Until recently, most dementia patients and their loved ones have been frustrated by a fragmented care system in which early diagnosis is rare, there are no standard treatment protocols, patients can’t get their questions answered, and there’s little support for caregivers. But health systems are starting to move beyond fear and denial. The program working with Helene was launched last week by Hebrew SeniorLife to pioneer an integrated approach to addressing Alzheimer’s and other forms of dementia. It is a multipronged initiative run by the new Center for Memory Health; Helene is participating in the family support part of the program. Hebrew SeniorLife is the first of eight institutions across the country adopting an outpatient dementia care model created at the University of California Los Angeles. The care is paid for by Medicare and private health insurance for most patients. It includes screening and consultation, nurse-led coordinated care management, and family support that works closely with patients’ spouses, children, and other caregivers. Among its goals: reducing the need for emergency room visits and the length of stay when patients are hospitalized. An earlier attempt to improve care coordination and help caregivers, started by the Alzheimer’s Association five years ago, has been gaining traction. Another effort involving a dementia care team working with patients and families is gearing up at Massachusetts General Hospital and may become a pilot for others in the Partners HealthCare system. “What you’re seeing now is a variety of approaches emerging,” said Jim Wessler, chief executive of the Alzheimer’s Association of Massachusetts and New Hampshire. Catie Borbotsina of Manchester, N.H., was referred to the association’s program in 2017 when her 71-year-old mother was diagnosed with Alzheimer’s. Under the program, she, her father, and her sister can set up short phone calls or e-mail with Jill Hovanasian, a Waltham-based social worker. She gives them encouragement, provides feedback and referrals, and suggests strategies on what to do when her mother forgets to set her alarm or take her medicines. An estimated 5.8 million Americans are living with Alzheimer’s — including one in 10 who are over 65 — and their ranks are projected to swell in the coming decade as the US population ages, according to an Alzheimer’s Association report last month. Yet many remain undiagnosed. An association survey showed only 16 percent are asked about their memory by primary care doctors during annual physicals. Changing that dynamic starts with early detection, said Brent Forester, chief of geriatric psychiatry at Partners-owned McLean Hospital in Belmont. “Even in 2019, with pretty amazing tools of diagnosis, only about half of dementia patients are diagnosed,” Forester said. Casting a shadow over the field is the lack of progress in developing disease-modifying therapies. When Cambridge-based Biogen and a Japanese partner scrapped a late-stage clinical trial of a closely watched Alzheimer’s drug candidate last month, it was the latest of more than a dozen setbacks for experimental medicines that tried to stop the memory-ravaging disease by reducing amyloid plaque buildup around brain neurons. As the disease progresses, and patients develop other related physical and mental conditions including agitation and depression, the burden falls increasingly on caregivers. Helping caregivers like Helene Oppenheimer fits squarely into the mission of Hebrew SeniorLife, a 116-year-old organization that offers health care and housing and conducts aging research. Its focus has long been “on the most vulnerable,” said its president, Lou Woolf. For Helene, being able to talk openly with someone who understands the course of the disease and can offer support is an important step on a new path into the unknown. Helene is an anchor for her husband, a former tax lawyer in Washington and New York who was diagnosed with early-stage Alzheimer’s in 2010. He and Helene, who worked for accounting firms, moved from New Jersey to Massachusetts to be closer to their son William. They have two other children living out of state. They lived together in an independent apartment at NewBridge for years until last July, when Martin’s brain could no longer control the motor functions in his legs. 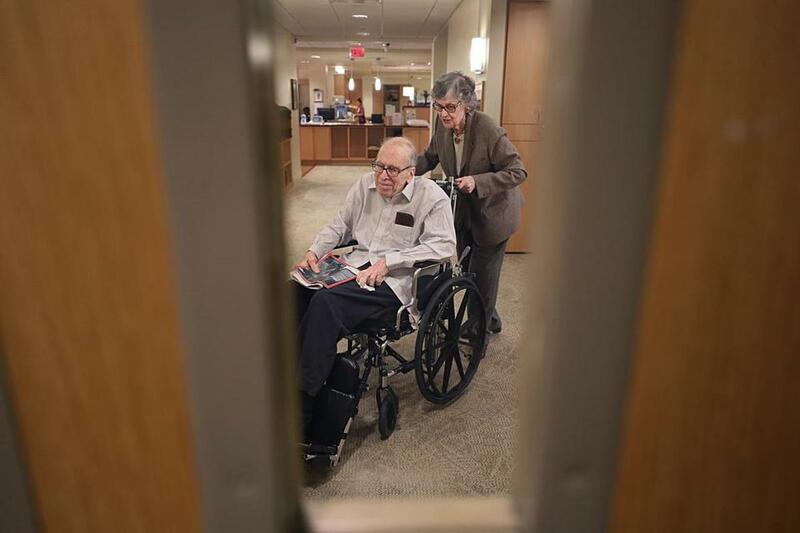 At that point, he was moved into the long-term memory care unit where health aides help him bathe, dress, and go from his bed to his wheelchair. Helene spends time with him every day. They read newspapers and magazines, listen to classical music and jazz and talk about their children. She fondly recalls Martin walking their children to school, taking them on sleigh rides in the winter, and reading to them at bedtime. But she admits that her husband, who once handled everything from complex tax issues to family finances, sometimes forgets he lives in Massachusetts, and can’t remember the name of the current US president. In a NewBridge sitting room one morning last week, Helene and Martin met their son William, who took a break from work to join his parents for lunch. The trio watched a video of a Westminster dog show on William’s iPad and talked about Helene and Martin’s upcoming wedding anniversary. “It’ll be 60 years in September,” Helene said in a wistful tone. A little later, Helene wheeled him into the dining room to have lunch.